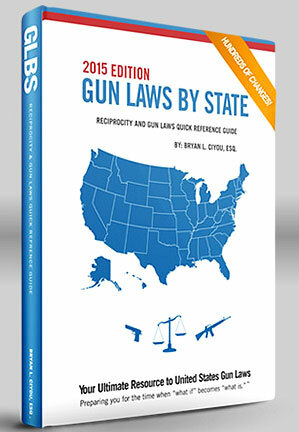 Indiana attorney Brian Ciyou has created an outstanding resource, Gun Laws by State (2015 Ed.) (GLBS), that explains firearms laws in all 50 states. Ciyou’s gun law treatise, available in both book and online (web) formats, covers state laws as well as key federal laws that apply in federal buildings, airports, National Parks, and school zones. There is a handy Reciprocity Map showing which states recognize concealed weapon permits issued in other jurisdictions. Moreover, GLBS covers Reciprocal Carry for all 50 states, Constitutional Law, Federal Statutory Law, Use of Force, Criminal Provisions, Civil and Criminal Liability, Preemption, Federal Property Rules, and Interstate Transportation. Share the post "Gun Laws by State — Know the Law, Protect Your Rights"